How to Fix dv2000 No Video No Wireless issues Nvidia Video Chip Separating from the system board. 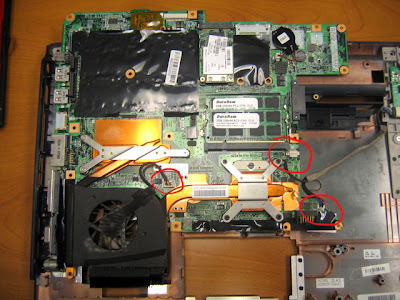 Copper shim, bga re-flow, no video fix hp dv2000. If you really decide to do that SEND ME YOU’RE COMPUTER I WILL TAKE IT!!!! After Part 3 of the DV2000 post or the last post of the other DV tear-down guides, you will have access to the system board ... you will need to take off the Heat Sink and fan assembly if you have made it this far you should be able to do that with no problem.. as well I would remove the processor from the ZIF socket.. and you will have this. These are Actual pictures of the DV6000 system board so your will look a little different ... but rest assured this has been tested to work on several dv2000 system boards. 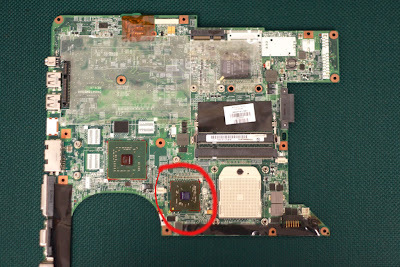 The chip that is causing the problem is circled.... that’s the Nvidia Video Chip. To be honest it is not Nvidia's issues don’t blame them it is actually the manufacturing process of the system board that is at fault the chip is fine and works great. During assembly the chip is attached to the system board via BGA soldering (Ball Grid Array) because of the heat generated by the video chip if heat is not wicked away properly and the proper amount of flux that was used the small solder joints under the chip will melt and eventually separate and no longer have contact with the chip and the system board. I tried this method today, and my dv2000 came back to life. Thx a million! Save me $170 for a new board that might have the same problem. My dv2000, which I had left for dead in the closet, is alive again! Thank you very much geekbook! Thanks. It's amazing. In 1 hour i solved my Black Screen problem with this tricks. From PORTUGAL. Penny works well. The GPU was hitting 90C before (and then failed) now it is at 70C (still hot but a lot cooler). I use a propane torch on a large (1 lb) bolt placed on the GPU. I heated the bolt to 220C and the weight helps (I've tried coins which did not work). Great! I used a 50 euro cent for soldering/warming, and a 1 euro cent for the gap(might be a little too high). Thanks! The penny works! My DV2000 (DV2313CL) backs to life! I used a 10 Real cent for soldering, and a 1 Real cent for the gap. GPU temperature is now between 68C ~ 71C. From Curitiba, Brazil. Thanks, It worked. My HP Pavilion dv2815NR KN998UA would only turn on for about 2 sec. The fan and LEDs across the top of the keyboard came on for 2 sec then turn off. I could repeat as much as i wanted same results. I heated the chip with a square copper plate with a heat gun on top of the board. Put together and works fine. I did every step carefully. When i replug the power cable to test, should i also plug back LCD cable into the board in order to see the screen? my computer shows nothing, even with or without the penny. Help please ! Am i missing any step or cable ? Hi I tried this and worked great I've read where after this fix the gpu drops to around 65 degrees celsius I installed a gpu monitor and mine is still running about 83 degrees celsius. What else can be done to help drop the temperature? I did use an older penny made of chopper and silver Arctic. Spot on thanx a million my wifes dv2000 now works again.....Saved me pounds. Well I only did the penny thing since I don't have a heat gun just lying around but so far so good. I've only had it running about an hour or so but it seems to be doing ok. Considering that I had no display at all prior to this...YAY! Gonna do the bios update so the fan runs all the time as well. I will comment again with any additional developments. THANK YOU SO MUCH! 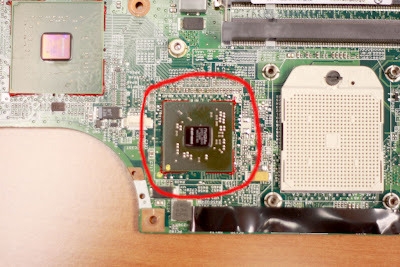 I don't own a heat gun, does anyone know if there's any way to repair the graphics chip without one?